Perma Anchor Fix - 80 is a polyester resin based grout which is used in locations where very high early and ultimate strengths are required along with chemical resistance properties. The product is supplied in pre measured two component units. Perma Anchor Fix - 80 is used for installation of dowel bars in concrete and for providing starter bars in RCC structures for continuation structural concrete or in extension of structural members. Perma Anchor Fix - 80 can be used for fixing foundation bolts, base plates and rail tracks. Because of its thixotropic nature the product is successfully used in vertical horizontal as well as in over-head applications. 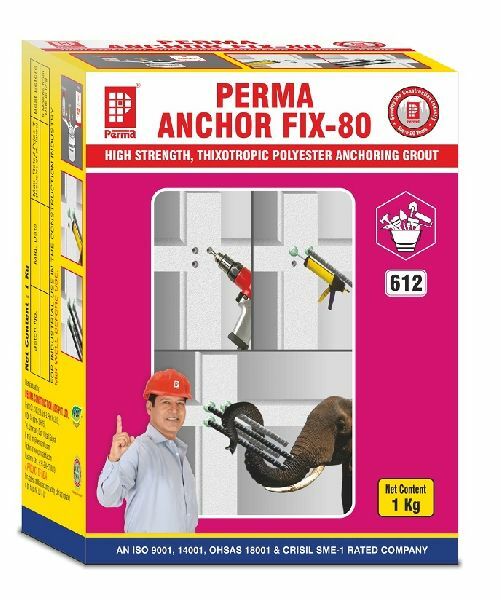 Packing : Perma Anchor Fix - 80 is available in 250gm and 1Kg packing apart from bulk on special request.